Mission-Engaged Resources Geared for the Enterprise (MERGE) is AMERICAN SYSTEMS’ Service Delivery Framework. We designed MERGE to ensure we provide top-quality independent services or end-to-end solutions comprising multiple services. MERGE enables us to engage our talents, capabilities, and best practices and thereby enhance and improve our clients’ mission success. MERGE benefits our clients. All our clients have a value chain that begins with a centralized mission and ends with the customers they support. Throughout this chain, our clients deliver value to their customers directly through the services they provide. As a premier provider of professional and mission-critical services, AMERICAN SYSTEMS seeks to integrate our talents and capabilities with the value chains of our clients. MERGE makes us accountable. By integrating our service delivery framework within our client's value chain, AMERICAN SYSTEMS becomes responsible for delivering discrete elements of the mission. MERGE delivers client satisfaction. By building upon proven engineering, scientific, and cognitive methodologies, MERGE serves as our foundation for delivery of AMERICAN SYSTEMS’ Strategic Solutions in support of our clients’ missions. Through MERGE, we provide measured assurance that the services we deliver produce effective, efficient, and consistent results. When applied to our client’s value chain, MERGE exemplifies the concept of "agile competencies." We start with our knowledge and understanding of the services we deliver and then tailor this baseline to best address our client’s value chain as defined by their unique mission, workflow, and operational environment. We take a two-phased approach to Service Delivery: PLANNING and DELIVERY. The PLANNING Phase begins during capture, well before any RFP or contract award. In the Planning Phase, we develop a Strategy by collecting requirements, listening to stakeholders, and prioritizing the major objectives, concerns, and governance issues relevant to our client’s value chain. Next, we construct a Design by selecting the most applicable set of our Service Delivery Models (SDMs)—those that best address the Strategy—and tailor those SDMs to complement our client’s value chain. Each SDM identifies the skills, processes, and tools to be employed as well as the metrics, risk mitigation, and outcomes that need to be achieved to satisfy the client’s mission. The DELIVERY Phase begins at contract award, when we instantiate our Design. In the Delivery Phase, we Transition our tailored SDMs into our client’s value chain to seamlessly integrate our proposed solution. Once this is complete, we begin day-to-day Operation using our tailored SDMs to deliver outcomes and collect metrics as per the Design in support of the Strategy. Throughout Operations, we identify opportunities for Continuous Improvement by analyzing metrics and assessing feedback. As we execute the mission, we continue to apply the Strategy, Design, Transition, and Operation paradigm using a disciplined change control process. Continuous Improvement then becomes a key differentiator; it is both a catalyst to the thought leadership and a source of efficiencies—benefits that our clients have come to expect from AMERICAN SYSTEMS. Through corporate-wide commitment and dedicated governance, every employee-owner at AMERICAN SYSTEMS shares MERGE as our common management and technical approach that spans all service offerings. MERGE promotes client satisfaction through repeatable and predictable activities and results. AMERICAN SYSTEMS operates all customer focused programs and internal corporate managed processes to strict quality standards. Selected programs and corporate managed processes have been individually audited/certified and are currently included within the scope of our ISO 9001:2015 registration. Our corporate-wide commitment to Quality Service includes harnessing the continuous improvement feedback that we receive and collect. To facilitate this, we formed a Solutioning Office whose purpose is to provide corporate governance for MERGE. This dedicated team of subject matter experts enables us to maintenance and mature our baseline SDMs. We monitor each tailored application of an SDM, identify improvements, and then incorporate those improvements into the baseline SDM. 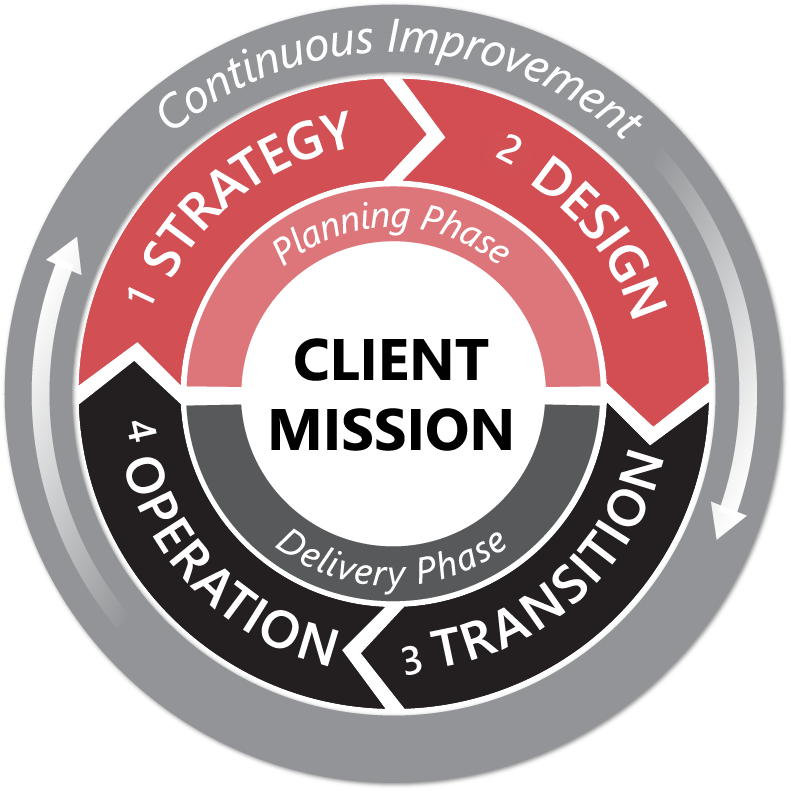 This enables us to share our experiences and improvements across many client mission sets. MERGE is, therefore, more than a mere framework—it is a "living entity" that is continuously maturing. MERGE is a reliable, efficient, and mission-focused management and technical approach that enables us to integrate our people, processes, and tools into our clients’ value chains.